In 1958 and just out of college, Gene LeDoux waited for his new Corvette which was overdue for delivery. His parents encouraged him to cancel the order and buy something else. As luck would have it, Gene did not give in and in the Fall his new red and white 58 Corvette arrived. Gene loved the car and as he drove around Rochester, he would wave at any other Corvette drivers going by which was few and far between at that time. He stopped to meet the owner of any Corvette he saw, no matter where it was or where he was going. One warm summer evening he was driving by Boehm’s Restaurant at 2223 Edgemere Drive and spotted a Corvette parked in the lot. Upon entering the restaurant, he asked who owned the blue 1959 Corvette outside. Al Fredrick had just arrived about fifteen minutes prior with a date on his arm and responded that it was his new Corvette. Al asked Gene to sit down with them and enjoy a drink. Of course the talk went to Corvettes when one of them mentioned it would be fun if Rochester had a Corvette Club. They talked on and finally Gene suggested they meet at his house. They set a date and time. This was the fun part. Al and Gene admit that they hailed other Corvette owners on the street in order to give them a flyer with information regarding the Corvette Club in-the-making. Their efforts yielded encouraging results. They found every Corvette owner receptive to the idea of starting a local Corvette Club. They found that Corvette owners came from every walk of life and this can make quite an interesting group. The flyers announced an “interest meeting” to take place at the Brooklea Country Club. The Club manager at that time was a Corvette owner himself. Some Corvette owners were able to submit the names of friends who were also Corvette owners. After awhile they had several owners interested in forming a group to cruise and exchange information about their Corvettes. Gene wrote General Motors Corporation that he was in the process of forming a Corvette Club in Rochester, New York. He asked if he could get a list of Corvette owners in the Rochester and surrounding areas. GM supplied Gene with a list of all owners of Corvettes in New York State. The first meeting of Corvette owners was called to order at 8:15 PM on Monday, September 21, 1959 at the Brooklea Country Club. All those present were enthusiastic about organizing a Corvette Club in the Rochester area. Several temporary committees were formed to handle problems until an election of officers could be held. Approximately 40 people were present. The second meeting of Corvette owners was called to order at 9:15 PM Monday, October 5, 1959 at Heinrich Motors on 214 Lake Ave. It was decided to call the proposed club “The Rochester Corvette Club”. The third meeting was called to order at 8:20 PM Monday, November 2, 1959 at Island Cottage Hotel. Elections were held and co-founders, Gene LeDoux and Al Fredrick were elected the first President and Vice-President respectively. 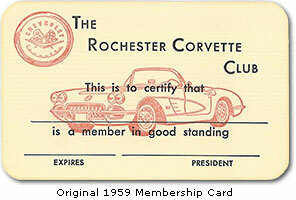 Both Gene and Al were instrumental in starting the newly formed Rochester Corvette Club in 1959. Since the election of officers, the RCC adopted a constitution and Gene had taken steps to incorporate the club, all of which had taken one year. The birth of the Rochester Corvette Club had finally become a reality. Through the years, a number of Presidents, Vice-Presidents and members have made it a point to keep Gene involved with the Club. Even though he no longer owns a Corvette, he will always retain a place of honor and respect as the individual who made it all happen. Gene is an Honorary Member now and has been very helpful in bringing us up to date about the early years of the Club. He still attends many functions and we are glad he is and always will be part of the Rochester Corvette Club again. The Rochester Corvette Club is a social club which brings many types of people together who have the same common bond, a Corvette. One of the original owners of the 1953 proto-type “EX 122 Corvette”, Jack Ingle, was an Honored Life Member until his passing in August of 2000. Each year the Rochester Corvette Club sponsors a charitable organization to support a worthwhile cause in our community. The charities are represented at our meetings and events. We hope we can play a small part to help a different group each year. All of our charities deal with those in need. Some of the charities we have recently donated to in the past 40 years include: The National Parkinson Foundation of Rochester, The Challenger Miracle Field, ALS Foundation, Patriot Guard Riders, OASIS Adaptive Sports and the Vietnam Veteran’s Memorial. As the Rochester Corvette Club continues to grow, our best days are ahead of us. This year we celebrate the 60th Anniversary of a dream that blossomed from a chance meeting one warm summer evening a long time ago by two guys with a common interest, a Corvette.